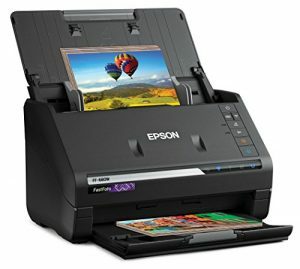 The Epson FastFoto FF-680W is tailored more to those who wish to digitize large quantities of photos due to it’s fast scan speed as it scans 4×6 photos at 80 ppm / 160 ipm. Epson’s FastFoto software helps you organize your photos as well as providing the ability to restore old photos. It is also a very capable document scanner as it is capable of scanning documents at up to 45 ppm / 90 ipm. Included with the scanner is Epson’s ScanSmart software which helps with organizing your documents. Another plus is the ability to scan to smartphones or tablets using Epson’s DocumentScan app which is available for both iOS and Android.